Page, Arizona is home to some of the most spectacular geological marvels you’ll ever see. Upper Antelope Canyon is possibly the most famous slot canyon on the planet, and with good reason. For photographers it’s as rewarding as it is challenging so here are my Antelope Canyon Photo Tips to ensure you get the best pictures you can. All of my pictures shown on this page were taken in a 45 minute window of opportunity. Here’s how to do it. 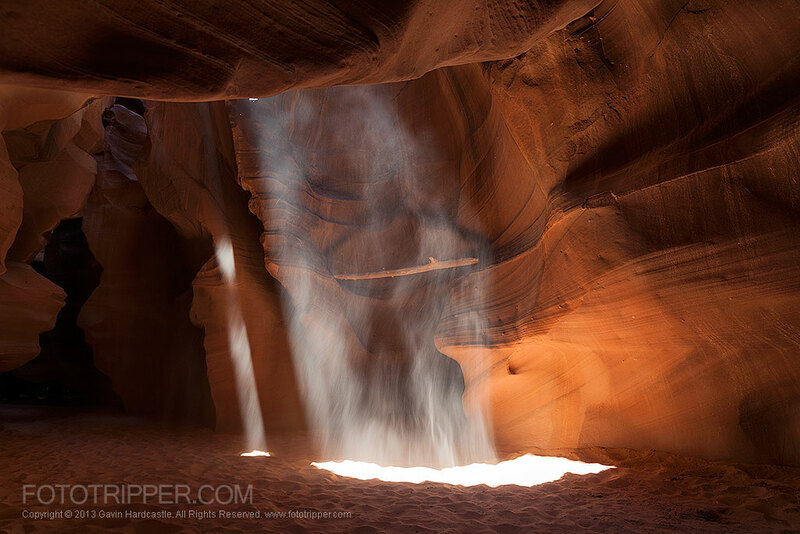 This article focuses on the scenic photography within Upper Antelope Canyon but there is so much scope for abstract photography within the canyon that it deserves it’s very own Part 2 – A Photographers Guide to Antelope Canyon. First and foremost you’re going to need to make some vital adjustments to your camera settings before even entering the canyon. This will ensure your camera is optimized for the rushed and challenging conditions inside the canyon. ISO Settings – Set the ISO slightly higher than usual. Landscape photographers rarely go above ISO 100 because we usually have the luxury of time and always use tripods. With Antelope Canyon you do not have that luxury. It’s dark and there are lots of people moving around so you’ll need to shoot fast. Set your ISO to between 200 and 400. Try 200 first to see if you can get away with it as 400 will start to introduce noise and degrade sharpness on most DSLR cameras. Aperture Settings – Set your aperture to slightly wider settings like f/8 to allow for faster exposures but still retaining some depth of field. You could go as wide as your lens will allow (lets say f/2.8) but that means shallow depth-of-field with the foreground blurred as you’ll introduce bokeh which you probably won’t want for these shots. Tripod Challenges – Pack a tripod that works well with a narrow footprint. Cheapo tripods need to go in the trash. If you think you’ll be able to spread those tripods legs like you usually do – think again. Get them as narrow as possible to avoid people kicking the legs and sabotaging your shot. Focusing – Forget ‘Live View’ for focusing, you won’t have time. Practice focusing manually with the view finder or get to grips with your cameras ‘auto-focus’ controls and pick your focus point carefully. I focused manually with the Zeiss 21mm Distagon and it was a joy to use. Typically I would pick a contrasting rock line about a third of the way into the image and adjust focus until it was as sharp as I could determine. Remove Filters – Ditch the polarizer or any other filter that slows down your shots. You do not need long exposures to capture the light rays. You will only get the light rays on a clear, sunny day. Check the forecast before booking. 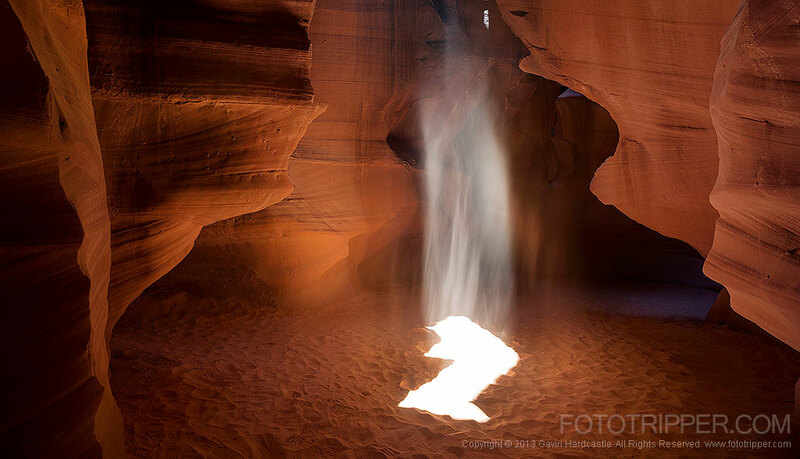 lower wall is lit up from the reflected light that hits the falling sand? The trick to capturing the right moment is timing. If, like me, you are obsessed with image quality you’ll no doubt have mirror lockup enabled and maybe a 2 second timer release. If so, you’ll need to watch your guide carefully and hit the shutter just as they throw the sand in the air. Time it too early and you’ll just have a shot of a sand cloud, time it too late and the effect has faded. You’ll get plenty of chances to get it right if nobody walks into your shot – which, I’m afraid, they will. As I’ve already mentioned, shooting in Antelope Canyon is a challenge. 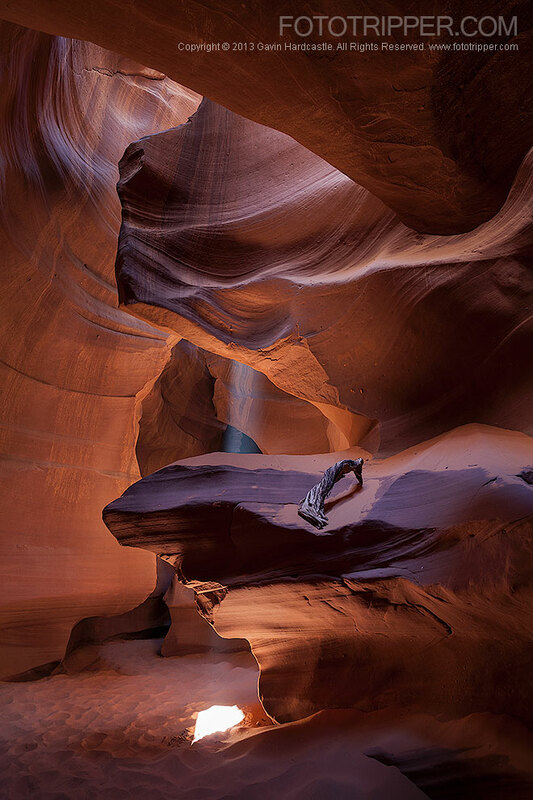 Photography is often a solitary pursuit and we aren’t used to sharing a tiny space with 200 other photographers but, that’s exactly what you’ll be dealing with in Antelope Canyon. Keep calm and mentally prepare for a scrum, stay cool and you’ll get your shot. At times it felt chaotic and rushed. Those shafts of direct sunlight only last for about 45 minutes so people are herded around in small groups in an attempt to make sure everyone gets a chance at the right shot. If you aren’t very practiced with your camera controls you might miss your opportunity, so get plenty of practice adjusting focus, exposure and aperture, as well as tripod adjustments. It pays to get on the good side of your Navajo Guide. If you act like a spoiled brat they won’t be inclined to help you get the shots you desire. You need them to get you in the right place at the right time and to put in some effort tossing up the shovels full of sand and pointing out the interesting formations you might miss. A lot of people complain about the profiteering of the Navajo by not allowing unguided tourists into sacred areas. Personally I think it’s essential that they keep things tightly controlled. Think about it for a minute. If they allowed all and sundry into Antelope Canyon it would end up being destroyed. Another thing to consider is that for $80 each we had a guide who helped us take LOTS of beautiful pictures. Compare that to the cost of a tank of gas to visit some other location which, if you’re lucky, might give you just one good shot. $80 starts sounding like a Bargain! Rain Cover – To protect your camera from dust if not weather sealed. You cannot enter the canyon without a Navajo guide. Go into the tourist information centre and book a guide through them. 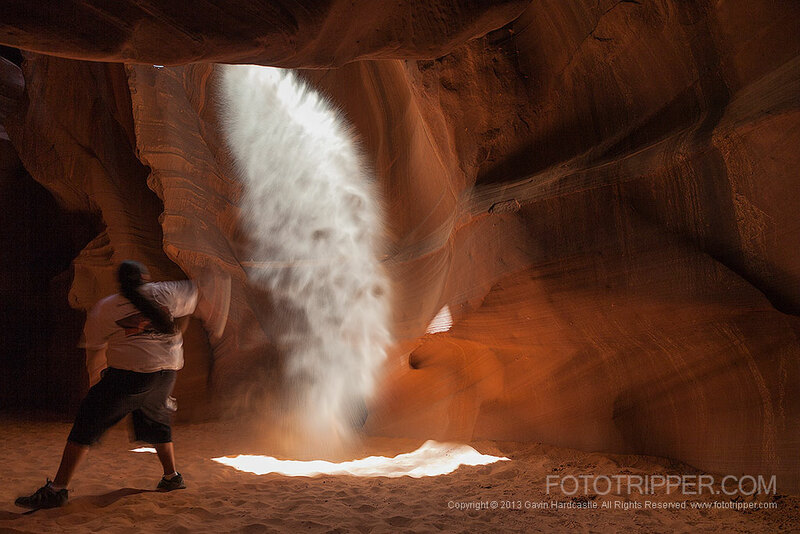 You meet the guide at their place of business and they will drive you to and from Antelope Canyon. We went with ‘Overland’ tours for $80 per person which means you don’t have to pay the additional park entry fee. Page has lots of choice when it comes to accommodation. As usual we stayed at one of the cheaper places so the Travelodge fit the bill. It’s close to everything and the essential wifi was usable. There are plenty of dining choices in Page, Arizona. We frequented the ‘Asian Cuisine – Indian and Thai’ which was decent and close to our hotel. Stromboli’s also did decent salads that were good value for money. When in Page you MUST go to Horseshoe Bend. There are also countless places on Lake Powell that will yield amazing photos but you’ll need to hire your own boat to get anywhere during good light. We paid top dollar to go on the round trip to Rainbow Bridge during mid day light which was not ideal. Next time we’ll rent a little speed boat and get there for early evening light. Also check out Lower Antelope Canyon and if you’re up for a drive, take a trip to Monument Valley. Please feel free to ask questions, post your thoughts and experiences and by all means share this article with your friends. Antelope Canyon Photo Guide Part 2 – Abstracts. JUST BREATHTAKING…. EACH PHOTO IS AMAZING…. THANK YOU FOR SHARING… ON MY “BUCKET LIST”… MOST BEAUTIFUL PLACE ON EARTH TO ME…. Thanks Donna, I would go there again in a shot. Wayne, you cannot go in without a Navajo guide. Fantastic shots! Was here last year .had only gotten in to photography .Was lucky enough to be on a tour which finished abruptly because of flash flooding threat but our guide let us hang back until the crowds had gone/ Wish I had known a bit more about shooting in this place especially now as Ive seen your images. Its amazing there and I hope I can return there again/ I shall never forget it. Reflections and texture intrigue me. We booked a tour with a company that said the sunlight doesn’t come into the canyon like in your shots when we will be there, which is mid-Oct. Do you know if that’s true or not? Our tour is for 1 pm which I know is late in the day, but I’m curious to know if the sun isn’t visible at all then. I’ve heard that the winter months don’t get enough direct sunlight into the slots so this may well be true. I’d call the tourist information centre and ask them about it just to be sure. 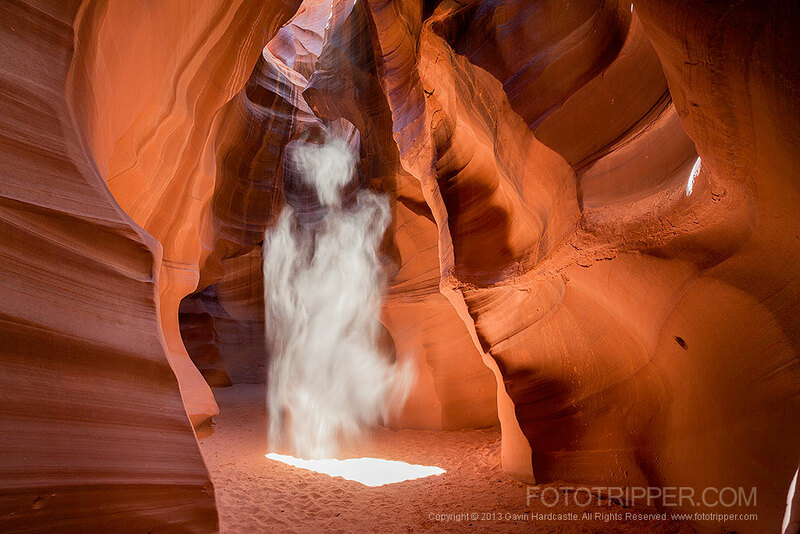 Hello Amy, I am planning to go to Antelope Canyon 15 October did year. Could you verify i fthe sunlight come into the canyon by these dates? Thanks a lot. Even more that the sunlight coming through, I’m concerned about a throng of people getting in the way. I will definitely have to take my blood pressure medicine beforehand. But it is a photography tour so hopefully the guide will clear out an area for unobstructed shots. 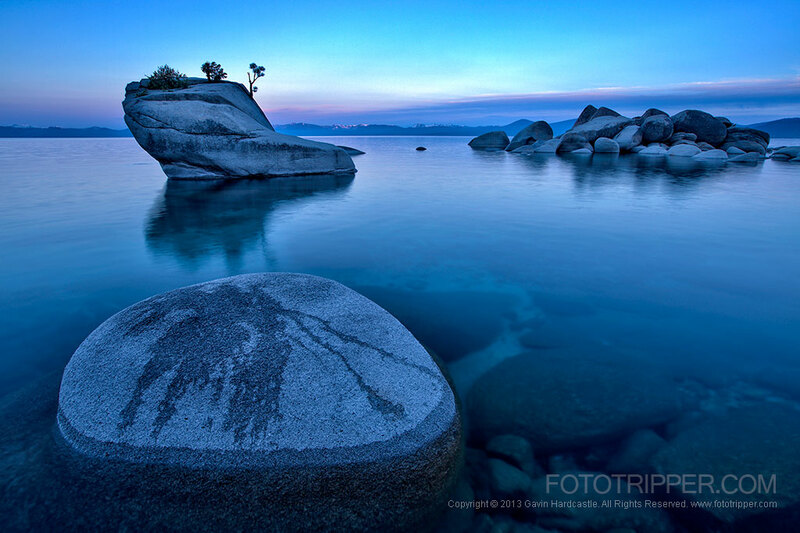 Canyon Photo Tips – Part 1 Scenics | Fototripperâ€. Excellent tips and most breathtaking photographs. Thank you Gavin. I went thru upper antelope canyon in early October. I did 2 trips on the same day. I did the tourist tour @ 7am first to get a feel for the later 2 hour photo tour from 11am to 1pm. Only took 300 shots. I was able to be better educated as to my photo essay which turned out to be 1100 wonderful frames, that were so graciously pointed out by my wonderful guide. I had 2 different guides. Both were very knowledgeable & photo savvy. I might try going back near June 21 for the best light shafts of the year, or, so I am told. Thanks very much for this informative post. I am visiting the USA from Darwin, Australia and am researching photographic locations/times etc. I come from a fairly remote location where there is never (ever) a problem of too many photographers/people in one location – this is definitely going to be a test of my patience/ability! I usually take all the time in the world ha ha. Appreciate the tips on taking multiple shots of the same composition for blending/layering later to eliminate people! Antelope Canyon will really test your patience. I almost had a full tantrum after just 15 minutes, but if you keep calm and stay the course, you’ll get some immense shots. What time of year are you visiting? Brilliant article. Thanks for sharing your wealth of information. Particularly like the ‘Photo bomber’..haha. Was you able to get the dynamic range all within 1 one shot or did you take a sequence to auto bracketed shots to ensure you covered the brightness of the scene? For some shots I was able to get away with one exposure but there were a few scenes that absolutely required bracketing to cover the massive dynamic range. Amazing photos! Cannot stop looking at these… I have had to go to Antelope more than once to really get it and I need to go again — now that I have a another new camera …. summer with the 12 or 1 pm tour was best — the sun streams right in. I found the Navajo guides were really great — and you are so right about being good to your guide. They know the canyon inside out and have good tips. I found taking a quick adjust monopod with a good head on it was way better than when I used a tripod — steadied me well (but I also shoot sports — basketball indoors– so I have had to learn to use it.) Gave me way more flexibility to get the shots I wanted without people hitting my equipment plus I could get out and move out of others way and get other shots while people were messing with tripods. I thought our last guide (whose name escapes me right now) cleared people out well to allow everyone to get the shots you want. True true about PATIENCE! Thanks for all the tips! I’m heading there in a few weeks, and I was wondering what tripod you’d recommend? Would a monopod be better due to the crowds? Any sturdy tripod is good. I would not use a monopod, remember, its dark in there. Gracias for taking the time to post this beautiful,description, Im going next August and ecxited to have all this imformation ahead of time, Thanks a millon. looking forward to picture the horse shoe bend. any tips for this place? Greetings Gavin. THANK YOU so very much for sharing your wonderful photos and tips. I am getting ready and doing my home work before my upcoming trip next week :o). I feel so much prepared what to expect and time to brush up my forgotten camera skill due to laziness and reliance on smartphone photography. Will keep your tips notes handy as reference materials. Great tips Gavin, and very nice photos! I will be heading there in a couple weeks, hope I can get at least 1 good photo. Question for wide angle lens, how wide do you suggest? I have the Tokina 11-16mm. Will this be too wide? I also have a 17-55mm, which I think would be more versatile in terms of zoom etc. Which would you recommend if I don’t want to change lens during the tour? Oh you’ll want to be changing lenses at some point. Take both and you’ll have the perfect range for fairly close quarters. Wow, what fantastic shots!!! Thanks for sharing the photos and the tips. I’ll be heading there in a week and I have booked with Overland Canyon Tours. I will be using a Nikon D600 with a Gitzo tripod. I have a Nikon 28-300 mm f/3.5-5.6, Nikon 24 mm f/2.8, Nikon 50 mm f/1.8 and a cheap Rokinon 8 mm f/3.5 lens. Which lens would you recommend I use? I can visit the Lower AC before or after the Upper AC tour (10am – 1pm). Would you recommend going before or after? I have seems photos with purple/orange color? Do you know how to get those photos. Once again, thank you very much for your tips!!! I reckon you’ll get the best results with the 50mm f/1.8 due to it’s speed and sharpness, however if it gets really cramped you’ll need something wider like the 24mm. Consider taking two cams because I wouldn’t advise changing lenses in that dusty canyon. As for lower, go any time. If you want purple/orange shots just tint them in photoshop or play with your white balance to decide which tint you prefer. The canyon in reality is a more creamy/sand colour and you’ll get more contrast on a brighter day. so may need to bracket. 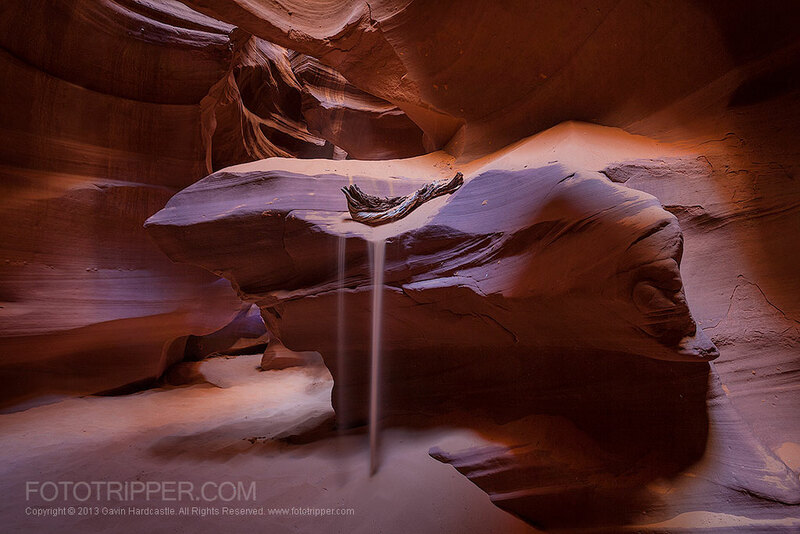 Hi I loved your article on upper antelope canyon. I’ll be out there in April to shoot upper canyon. What guide company did you go with? There’s so many. We went with Overland tours. Hi. Thanks for sharing the Awesome photos. I’m planning a trip to the antelope (upper and lower) canyons in a couple of weeks, and I also plan to visit horseshoe bend and monument valley. I’m stugling with desciding what lens to take/rent. I have a nikon d3300 with the kits lens, plus a 55-200, 35mm/1.8 prime, and a newly acquired tamron 18-200 (to avoid switching lenses). I’m questioning wheather I should use the 18-200 the whole time, or should I stick to the 18-55 since it’s a little sharper. Would I need the extra zoom? I dont want to switch lenses inside the canyon. Also, I want to rent a 10-24 or so (wide lens) for the river bend. I plan to take a backup D40 that I have just in case. I’d say your decision depends on what you’re prepared to carry vs the types of shot you want. The 35 prime, the tamron and a super wide should cover most requirements I would think. Thanks so much for all your tips. I certainly need all the help I can get before I go. One question about the lens I should take in ams I only have one camera body. I have an olympus omd1 camera and tend to mostly use my 12-40mm f:2.8 pro lens but I recently purchased the 50-150mm f:2.8 lens. Would I best to use the first lens mentioned? Great camera Marg. Ideally you’d use both. The wide will allow you to get close to the light rays and fill your frame with plenty of canyon but the longer lens will get you close to the abstract shapes high above. If it’s not too crowded and there’s no wind and you make sure you’re nowhere near the flying sand, you might just get away with a lens swap mid shoot. If you have someone who can help you switch with blower in hand you’ll be alright. Not as good as rocking two cams but if you’re suuuuuper careful you might be fine. Practice first. Top tip – if you do swap lenses, leave the long lens for the later half of the shoot and keep it on. There’s less pressure to shoot the shapes above because they don’t have the ever decreasing light rays. Those are very nice pictures for the 45 minute blast. I have a Nikon D300 and D7100. Nikon10-24mm,Nikon 17-55mm fixed aperature 2.8, 70-300mm, and 80-400mm. and three primes 35mm 1.8gdx, 50mm1.8, 85mm1.8. I hope to leave as much in the car as possible. Given the gear and the inability to change lens (safely) for Upper Antelope what would you use based on your trip? Also while taking pictures of lower Antelope, Horseshoe Bend, Rainbow Bridge and Monument Valley did you use any filters such as Lee or Cokin graduated or standard neutral density to cut the exposure down on the sky or graduated tobacco etc. filters to bring out the color in the canyons? Did you use a handheld meter? I am guessing probably not for the Upper Antelope trip, but how about for the other shots? I never use grads. I find them pointless unless you’re shooting a flat horizon hand held. I just use the evaluative meter in the camera. Try shooting with different white balance settings to get the right colour temp for your taste. From the gear you listed I’d be tempted to limit it to the 10-24, the 50 prime and the 80 prime. It is nice to have more of a zoom for the distant features but that’s a lot of glass to carry into a crowded slot canyon. Thanks for the great info and great images Gavin. I am heading there on Dec 28 for a morning shoot. I have heard that lower canyon is less crowded and likely even less I hope between Christmas and new year. From what I am reading, I should take 3 of my lenses, 8-15, 16-35, 24-105. I do have a second body but it is a crop so maybe put my 24-105 on it? Which do you recommend, Upper or Lower Canyon? Unfortunately I can’t do both because I am traveling with non-photographers. I am asking from a photography perspective not hiking difficulty. All three lenses will cover the entire possible range you’ll need. For December there won’t be any light rays in Upper so if you can only do one I’d be doing Lower. Good luck. I reckon you’ll get more mileage out of the 24-105mm. I shoot in Manual but yes you could shoot in aperture priority, just be sure to set your max IS0 so that it’s not too high. As for tripods, you don’t need super sturdy because there’s no high winds. Hi, I loved your article, and pics. Very instructive. I will be visiting the area next March. I am very new to phoyography, but I love it. I am more into Photo artistry. I am doing a family trip, I will not be able to do the Photographers tour, but I would like to make the best of my visit. I would like to know which would be the best time to visit each Canyon, so I can get good shots? Also I am planning to take the Antelope Slot boat tour, do you know what time would also be the best? Hi Amelia, I don’t know about ‘Antelope Slot’ boat tour so can’t advise there. Any time is going to give you gorgeous results but you can only enter upper with a Navajo guide whether you’re taking phone snaps or DSLR shots. Lower can be done on your own. Hi. Loved your photos and the information. My question is, do you have to pay for photo rights in order to post any photos of the canyon on social media? I think you only need the permit/license if you intend to sell the images but it’s best to check with the Navajo nation first. You can’t access the canyon without a Navajo guide. Get used to being rushed. You may be able to book a private guide for a tour during quieter times which gives you longer in the canyon but I expect it won’t be cheap. Get a list of reputable guides from the visitor centre and call a few to see if you can get a special deal. Hi Gavin, thanks for sharing this. Very nice photos you have taken. May l know what shutter speed l should put? If I have a tripod and l use a dslr and set with ISO 100, f8.0. What shutter speed should l go? 2 sec? It totally depends on how bright the light is during your visit. Your cameras built in light meter will be able to tell you the ideal EV. I like ‘evaluative’ mode. card. etc.. Can you please enlighten me so I can take some great pictures? Yours came out excellent. Deciding which WB to choose is more of a creative decision. Depending on your camera you’ll capture more faithful colours by choosing AWB, however some people prefer to ramp up the reds or purples by deliberately choosing a WB that records less realistic colours. Personally I prefer AWB and that’s what I used for these shots using a Canon camera. Other cameras may not have as accurate a settings when in AWB. I know my old Sony A7R had terrible AWB but my newer A7RII gets it right almost always with AWB. Thank you Gavin. I have a Canon. By the way. 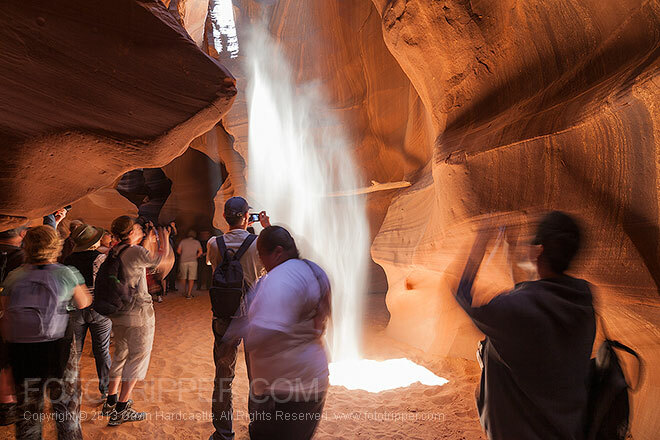 For some of your readers that may be interested and planning on going to Antelope Canyon, a couple of the tour companies have done away with the photography tours effective this month (March). I just so happen to have booked it early enough where they are honoring my booking. A reason given was that it was creating a backup at the entrances of about 45 minutes to an hour. So does that mean it will only be iPad waving zombie armies and no real photographers? It appears that way. It’s a shame. Real photographers will not be able to experience a good photography shoot with “iPad waving zombie armies” bumping and getting in the way. I hope that changes back to their original format in the future. This is a total disaster. I’ll do some research and see what’s going on. Thanks for the tip Carlos. Thank you for the article. It’s very informative. 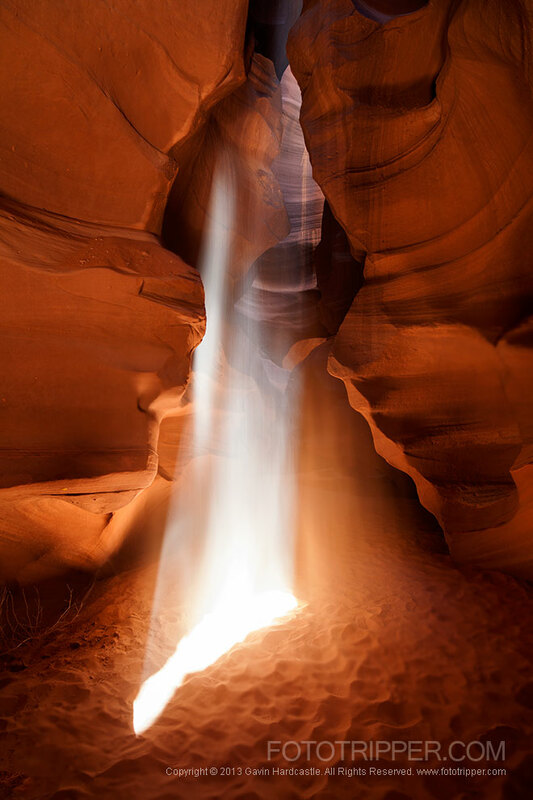 Our camera club is planning a trip to Antelope Canyon in April. We do have a photo tour booked and it will be limited to 8 photographers. I have a Nikon DSLR with a cropped sensor. I’m wondering if my 18-140 lens will be wide enough. I do have a Tokina 11-16 wide angle lens but it is new and I don’t know if it will be too wide. I’m still becoming comfortable with it. Any recommendations would be appreciated. Would that be full frame or crop? Thank you for this SUPER article. I have Fuji XT2 with 16-55 fujinon lens,f 2.8 (equals to 24-85 DSLR). I plan not to change lens. I am just a beginner. Is it wide enough? Do you recommend to use rain jacket or camera cover for dust protection.? I wonder when you take a picture of a light beam, what camera settings do you use? Manual focus? F8 and shutter speed as evaluated by camera? By the way,both lower antelope canyon tours company seem not to offer photo tours anymore this year 2018. 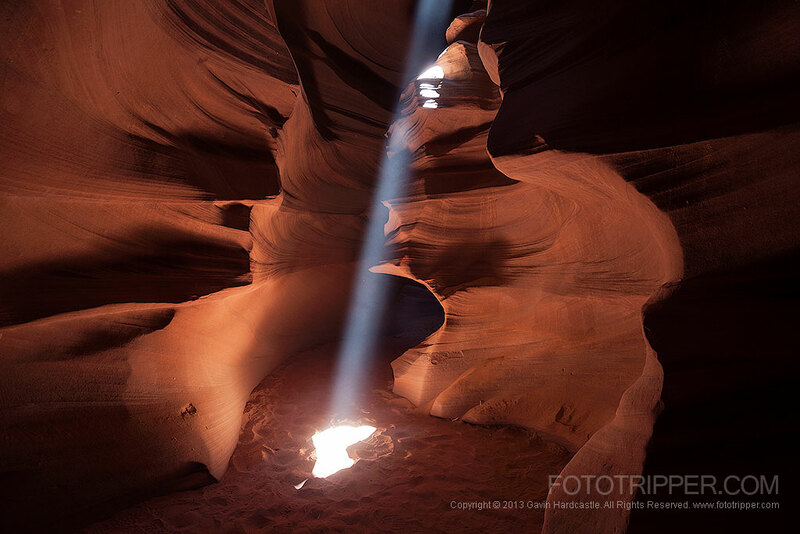 So I reserved just upper antelope canyon photo tour in June. However, a few days ago, they cancelled my reservation and only offer change to other dates only in April which I cannot accomodate. Luckily, I still can book a seat with another company. Not sure what happened. I believe that’s all mentioned in my article. Yes I reckon your lens will be wide enough for the larger sections of the canyon. Would love to know what that cancellation was all about. Thanks for posting this perspective, Gavin. This is one of the better overviews of any photographic destination that I’ve read. Thanks for the detailed technical tips on how to achieve optimum results. I especially appreciate the tip about developing a connection with the guide. I believe in that as well. cheers. Hi, Gavin. 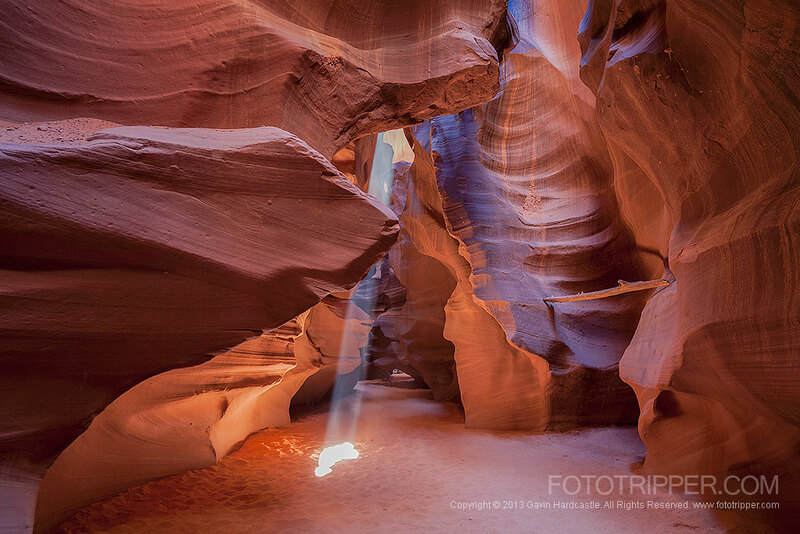 I’m planning a trip to do the Great Circle in April of this year and found this article while looking for recommendations of focal lengths to use in Antelope Canyon. Actually I think I’ll go to another slot canyon in the area, since Antelope Canyon is so crowded now. Thanks for the photos and information. You do a great job. Hi Gavin, I also just found your article and thought it very helpful. I’m going to be at upper antelope Canyon the first week of June 2019. A couple of technical questions perhaps you can answer for me as I want to be as prepared as possible. I assume you used HDR photo bracketing but you didn’t really say. My question is I have an Olympus OMD EM1 ii, which can bracket three five or seven shots. What would you suggest. Are the lighting conditions fairly consistent throughout the canyon, or are you changing settings at every different shot. I plan on using OLYMPUS new ProSeries lens 7mm to 14mm with an appature of around 5. This one may sound a little weird, I know you said and other people also say bag your camera with a shower cap, rain bag, etc. I’ve never done this, my question is how do you get to the controls to adjust the different settings. Can you perhaps get a little more in depth on that issue please. Those bags have little slots for your hands. 3 brackets should be fine. No the light changes drastically while the sun hits the sand in the air.